Helical (or Spiral) Submerged Arc Welding (HSAW) allows for larger, thinner-wall welded pipe, but this benefit has a cost—a higher chance of welding defects. By enabling greater visibility and control during processing and tacking, high dynamic range (HDR) weld cameras are a powerful tool to counter this risk. HSAW has a unique capability for producing large diameter pipes for flammable and nonflammable liquid transportation. While longitudinal pipe welding is limited to approximately 42” (1.1 m) outer diameter due to the size of the feedstock sheet, helical pipe welding is only limited by the size of the equipment, allowing pipes as large as 140” (3.6 m) outer diameter to be manufactured. Helically welded pipe also has a distinct advantage over longitudinally welded pipe because the radial stress in the weld seam is not concentrated along a single axis but instead rotates around the circumference of the pipe, creating a more-even stress distribution. This advantage allows for thinner tube wall construction using more economical, non-high-strength materials. Spiral welded pipe is made using either one-stage or two-stage weld processing. While both processes begin with the incoming skelp coil of material being unwound, flattened, trimmed, squared, and then fed into the forming stage, in one-stage processing, the forming process is immediately followed by simultaneous inside and outside Submerged Arc Welding. In two-stage processing, the material is formed and tack welded into the pipe body shape by a gas metal welder prior to the Submerged Arc Welding process. The tack welding stage is critical for the quality of the pipe because misalignment of the initial tack will cause defects when further processed during the Submerged Arc Welding stage. Numerous factors can cause misalignment, including defects in the metallurgical properties of the feedstock, gaps between sheets, misalignment of the welding heads, or dull tooling during the processing of the skelp coil. With the latest in camera and software technology, the Xiris XVC-1000e high-dynamic-range weld camera permits the operator to see the spiral pipe feedstock, the weld head, and torch location relative to the weld seam during the welding process. By monitoring the images directly, an operator can make adjustments to the material inputs or torch position to quickly correct the fault before the defect propagates throughout the length of the weld. The camera’s robust, IP65-rated enclosure allows it to survive the harsh environments of HSAW pipe mills. 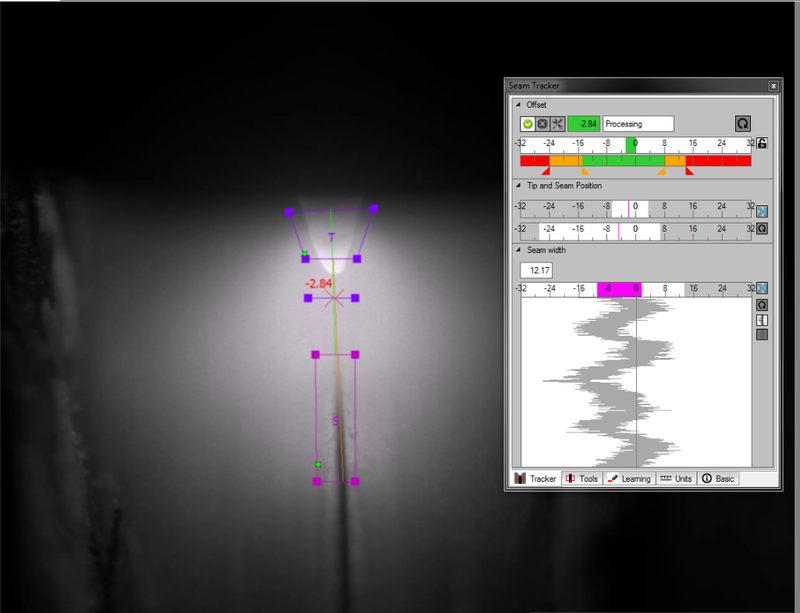 Additionally, the XVC-1000e can be used with Xiris’ seam tracking software, as shown in the figure below. The seam tracker software identifies the location of the welding head and the arc contact with the material and the material seam, detecting fluctuations in alignment. With such software, out-of-alignment conditions can automatically alert the operator to make process-control adjustments or even provide closed-loop feedback to automatically move the torch back into position. Adding a Xiris XVC-1000e weld camera to an HSAW pipe mill can help operators monitor the feedstock material forming process and alignment to the welding torch, ensuring that minimal defects occur during the preliminary material processing and forming stages. In so doing, pipe weld quality can be improved, reducing the risk that weld defects will propagate down the pipe mill and make it to the customer.